Bokhara is a city or great beauty, thus everything that is related to this places carries the splendor of its colors and ancient culture, the images of the shining sun and rising phoenixes. The city is full of colors, luscious scents, gardens, and flowers. At the same moment Bokhara is the name used for the rugs with a specific design have been made by the Tekke tribes in Central Asia. It is one of the most important Turkmen tribes in the area. Their rugs can be easily recognized due to the brick red color and other elements of the design such as diamonds, lozenges, and flowers. The design of the rugs weaved by the Tekke tribes consists of a central field and colons of minor and major Tekke guls or flowers. These rugs are of dark red color, but they include light and bright blue and green, white and yellow. They use three main dyes, madder, indigo and a yellow dye that is still a mystery. Their combination generates other colors that never exceed the number of eight in one single rug. The Bokhara rugs that once have traveled through the Silk Road from Turkmen tribes to other parts of the world, continue to be one of the main products that Tekke tribes continue to make in order to meet their needs and the increased demand from western countries. The members of the tribes who have always spent their life in tents have thought about rugs as floor covering elements that that protect them from the cold. Hence, like all the other tribes that live in middle or in the Far East, they started to weave carpets and included designs that reflect main elements of their culture. 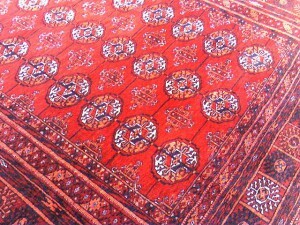 Although that the Bokhara carpets look similar, there are no two identical handmade rugs. The fact that the Tekke use an asymmetrical knot doesn’t affect the overall symmetry of the rug. 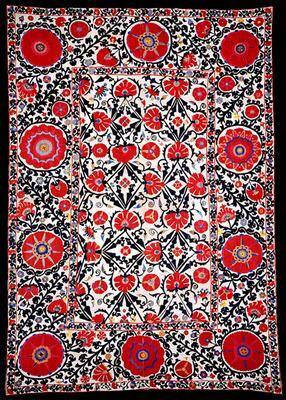 The flower, gul, one of the main motifs of these rugs is enclosed within a pattern named the elephant foot. Rows of guls and geometric patterns make the main elements of the central field of a Tekke carpet. In the case of Bokhara rugs, the color is of the indicators that define the age of the rug. Strong green is present in older Tekke carpets when they have been well-preserved. These lovely little red rugs full of guls and geometrical shapes are very precious and highly desired by western buyers, as an element that is strongly related to the tribal culture of Turkmen people.